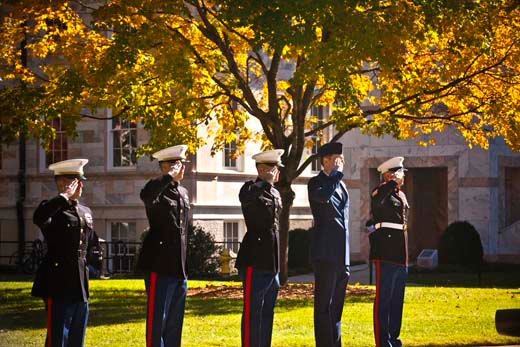 The Emory Veterans Association invites the Emory community to the annual Veterans Day Ceremony on Wednesday, Nov. 11, at 10:55 a.m. on the Quad. The ceremony will celebrate the nation's veterans with a special word from campus leaders and retired Army Col. Jesse Brokenburr. Members of the veterans' community — including active duty, reserves, inactive reserves and Emory ROTC cadets — will participate. The participating veterans will march out to the flag pole at 10:55 a.m. After the bell rings 11 times, attendees will hear from speakers including Gary Hauk, university historian, vice president and deputy to the president; Emory University President James Wagner; and Brokenburr. "We hold the ceremony at 11 a.m. because Armistice Day, which predates Veterans Day, celebrated the end of WWI – the 11th hour of the 11th day of the 11th month," says Andrew C. West, senior center administrator, Atlanta Clinical and Translational Science Institute. After the ceremony, attendees are invited to enjoy refreshments provided courtesy of Tab Ansari, professor of pathology in the School of Medicine, who served in the Navy and is a Vietnam veteran. "I believe that we do not really teach our children and young citizens how much we truly owe as a nation to the ones who paid the ultimate price, the ones who lost their limbs, the ones whose mental status was forever changed due to the horrors of war so that we can walk freely along the streets and live without the fear of oppression," Ansari says. He sees the importance of Veterans' Day as a reminder to think about these issues. Brokenburr is the brother of Campus Services employee Willie Brokenburr, whose co-worker Robert Jaynes informed Emory Veterans Association about him. Brokenburr was an instructor at the U.S. Military Academy at West Point and is retired from the Pentagon. The event is sponsored by the Emory Veterans' Association, Employee Council, Student Government Association, Graduate Student Government Association and the Emory Alumni Association. Veterans at Goizueta Business School have also been active this year, holding events there to raise money for homeless veterans in the community, according to Zachary Nesbitt, GBS MBA 16, co-president of the Emory Veterans Association. The Veterans Club at Goizueta Business School, which is separate from the Emory Veterans Association, recently raised funds and conducted a clothing drive to support the Veterans Empowerment Organization in Atlanta. Emory is committed supporting veterans as students and in the community. In the 2014-2015 academic year, Emory invested over $1 million dollars in financial aid to students who are veterans through the Yellow Ribbon Program, which allows degree-granting institutions of higher learning in the U.S. to voluntarily enter into an agreement with the VA to fund tuition expenses that exceed the annual VA tuition and fees benefit. All of Emory's nine schools have chosen to participate. Meanwhile, Emory's Veterans Program offers post-9/11 veterans and their family members a variety of support resources. The program is focused on helping people in the Southeastern United States get help for post-traumatic stress disorder, traumatic brain injury, military sexual trauma, anxiety and depression.